Home > News > Product Knowledge > What are the Requirements for the Vertical Impact Crusher Hammer in the Production Side? What are the Requirements for the Vertical Impact Crusher Hammer in the Production Side? The main components of the include springs, railings, counter-attacks, plate hammers, linings, etc. The shape of the hammer is closely related to the fastening method and working load. Its design should meet the requirements of reliable work, easy loading and unloading and improvement. Hammer metal utilization requirements. When installing the hammer, pay attention to the same weight and install it in the relative position to avoid the imbalance when the rotor works. Let us talk about the manufacturing requirements of the vertical impact crusher hammer. 1. The hammer of the vertical impact crusher is often made of high-strength high-manganese steel, high-chromium cast iron, alloy steel, malleable cast iron or other wear-resistant materials. The most widely used in China is high-strength cast steel. 2. The vertical impact crusher meets the input material from top to bottom and can throw it onto the upper counterattack. 3. The shape of the hammer is in addition to the common long strip shape, there are various shapes such as t-type, s-type, work type and grooved type, and the most widely used is the long strip shape. 4. The repair of the hammer can be carried out on the carbon steel plate and the high manganese steel plate for the wear-resistant material. 5. 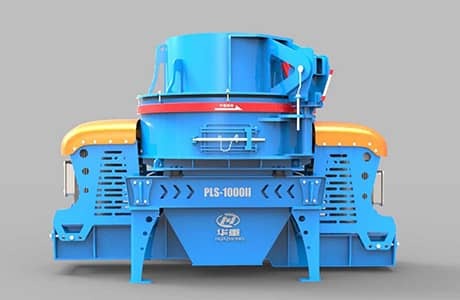 The weight difference of each plate hammer of the vertical impact crusher should not exceed 50 g, otherwise it will seriously affect the balance of mechanical use. 6. When replacing the hammer of the vertical impact crusher, all the hammers must be removed together to change the surface to prevent the rotor from losing balance and vibration inside the crusher, resulting in production accidents. 7. The vertical impact crushing machine cannot be opened during the operation due to the over-tightening of the hammer card, causing the vibration of the crusher. 8. The gap between the hammer and the slab should be consistent and should not exceed the error of two mm. 9. The number of plate hammers is related to rotor specification. The larger the rotor specification, the more plate hammers.